High schoolers take a break from studying the 3 R's and head to Sandy Beach to soak up the 4 S's: Surf, sun, skin, and sand. On the southeast coast of the island, this run of open sand is a short hop from both metro Honolulu and the Windward side. Car stereos along a long parking lot play counterpoint to a tier of shorebreaks that are good for bodyboards and shortboards. When competitions are held, the scene really amps up. Close to Sandy Beach, is Koko Crater, a volcanic cone that hold a botanical garden in the acres of it's interior. Though not an action scene for teens, birds go wild among an orchard of plumeria trees, gardens of exotic and native palms, and numerous varieties of cacti that seemingly were invented by Disney cartoonists. Admission to the garden is free. 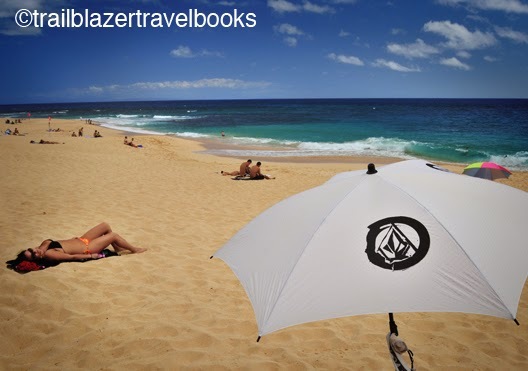 Pages 90 to 93 of Oahu Trailblazer has more details, plus other stuff on this coast, like snorkeling tide pools.